Badminton World Championships Highlights: PV Sindhu defeated Indonesia's Fitriani Fitriani to enter the next round of the Badminton World Championships. Badminton World Championships Highlights: PV Sindhu defeated Indonesia’s Fitriani Fitriani to enter the next round of the Badminton World Championships. It was an easy task for the Indian as she completely dominated with her speed a and strength to register a win in straight games. 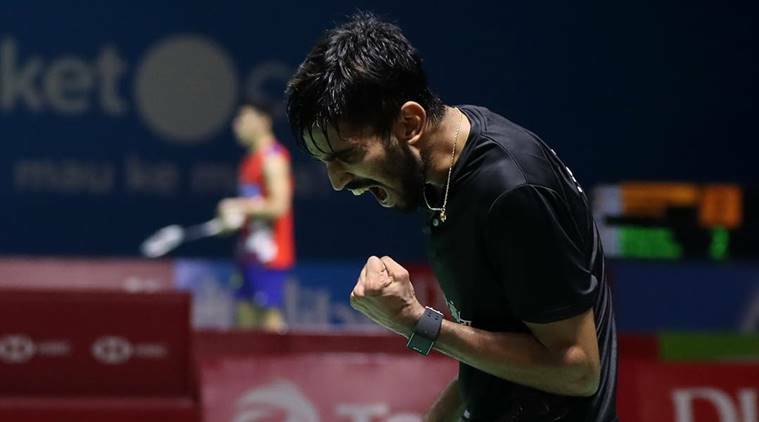 Earlier, Kidambi Srikanth beat Spain’s Pablo Abian 15-21, 21-12, 14-21 and booked his place in the third round where he will face Malaysia’s Liew Daren. HS Prannoy crashed out of the tournament after losing to Brazil’s Ygor Coelho 21-8, 16-21, 15-21. The doubles team of Satwiksairaj Rankireddy and Chirag Shetty and Ashwini Ponnappa and N Sikki Reddy also crashed out of the tournament after losing their respective matches. PV Sindhu beats Indonesia's Fitriani Fitriani 21-14, 21-9 to enter the next round. Also, Sai Praneeth beats Luis Enrique Penalver 21-18 21-11 to enter the next round. Excellent stuff from PV Sindhu as she set up Fitriani for a perfect smashed by pushing her towards her left and then smashing it on the right. Excellent play from the Indian. Sindhu leads 17-7. PV Sindhu leads 11-5 at the break against Indonesia's Fitriani Fitriani. PV Sindhu has taken a 9-5 lead over Fitriani Fitriani in the second game. Sindhu is in total control. She picks up another point after Fitriani smashes it on the net and she roars in delight. Sindhu leads 10-5. Indonesia's Fitriani Fitriani is not giving it away all easily in the second game as she is trying to match up with Sindhu's pace and strength in the second game. But a couple of unforced errors has seen PV Sindhu take a 5-3 lead. PV Sindhu wins first game! PV Sindhu has won the first game 21-14 easily against Indonesia's Fitriani Fitrania. PV Sindhu has a game point opportunity as she takes the serve. She leads by 20-12. Can she finish the game in this rally? Nope, an unforced error from her gives Fitriani a point. PV Sindhu's defensive shot against a powerful smash from Fitriani did not come to her aid as she dropped the third point on the row. Sindhu still leads 17-10. PV Sindhu has been absolutely dominant in the first game and now she has taken a strong 7-point lead against Fitriani. She is countering Indonesia's speed with powerful shots and her attacking display is confusing Fitriani. Sindhu leads 7-14. Sindhu leads at the break! PV Sindhu leads 11-7 against Indonesia's Fitriani Fitriani at the break in the first game. PV Sindhu has taken a four-point lead in the match with Fitriani making unforced errors in a row. Sindhu leads 5-9 and it seems that the Indian will be leading at the break in the first game. PV Sindhu's excellent drop shot has earned her another point after a good rally. Sindhu is trying to stretch the game wide but Fitriani is matching toe-to-toe with the Indian. But she could not muster the quickness to counter the drop shot, though. Sindhu leads 5-4. PV Sindhu takes the lead early on in the match after an exciting rally that saw both the shuttlers chasing after the shuttle. But Sindhu kept fluttering it wide from right to left and eventually Fitriani could not reach it. Sindhu leads 2-1. PV Sindhu is now out in the court and she will face Indonesia's Fitriani Fitriani. Sai Praneeth B is in action against Spain's Luis Enrique Penalver. Yuki FUKUSHIMA and Sayaka HIROTA beat Ashwini PONNAPPA and REDDY N. Sikki 21-14 21-15. HS Prannoy has crashed out from the World Championship after losing to Brazil's Ygor Coelho 21-8, 16-21, 15-21 in the Round of 32 match. Ashwini Ponappa and N Sikki Reddy are trailing 11-4 in the first game against Japan's Yuki Fukushima and Hirota Sayaka at the break in the first game. Satwik Rankireddy and Chirag Shetty lose 21-1815-2121-16 against Denmark's Kim Astrup and Anders Skaarup Rasmussen. Ygor Coelho has defeated HS Prannoy 21-16 in the second game. HS Prannoy is trailing in the second game against Brazil's Ygor Coelho by 8-11. Astrup/Rasmu have taken a lead of 11-6 at the break in the third game. HS Prannoy has won the first game 21-8 against Brazil's Ygor Coelho. He is on the verge of winning the second game. Chirag Shetty and Satwik Rankireddy have won the second game 21-15. All is level now and the match will go towards the deciding game. HS Prannoy leads 11-6 at the break in the first game against Brazil's Ygor Coelho. Satwik Rankireddy and Chirag Shetty have taken a 11-5 lead over Denmark's Kim Astrup and Anders Skaarup Rasmussen in the second game. Meanwhile, HS Prannoy is now in action against Brazil's Ygor Coelho. Satwik Rankireddy and Chirag Shetty lost the first game 21-18 against Denmark's Kim Astrup and Anders Skaarup Rasmussen. After trailing by 11-6, the Indian duo fought a hard fight to level the score at 18-18 at one stage. But losing three points on the trot, ended their resistance. Rankireddy and Shetty are trailing 6-11 at the break in the first game. Good start by the Denmark duo. Can the India boys bounce back? The Indian duo Satwik Rankireddy and Chirag Shetty are now up against Denmark's Kim Astrup and Anders Skaarup Rasmussen. This is epic encounter in Men's doubles. Pablo Abian was quite brilliant in his match against Srikanth and this is just an example of that. Axelsen beat Huang 21-17, 21-8 in what turned out to be a one-sided affair in the end. Japan's Akane Yamaguchi beat Germany's Fabienne Deprez 21-17, 21-10 to book her place in the next round. Indonesian pair Marcus Fernaldi Gideon and Kevin Sanjaya Sukamuljo have beaten China's Han Chengkai and Zhou Haodong 18-21, 21-14, 21-18. Up next, Danish star Victor Axelsen plays Huang Yuxiang in his men's singles second round match. An exciting anti-climatic finish as India's Kidambi Srikanth bounces back effectively to win the match 15-21, 21-12. 14-21 to progress to the next round. Exciting badminton between the two which progressed to three games. Pablo Abian hits it wide and now Srikanth has a match point. He leads 20-14. A number of unforced errors from Pablo Abian, who looks frustrated, and is now trailing by 5 points. Srikanth has a massive advantage now as he looks to progress to the next round. Srikanth leads 13-18. Three points on the trot for Srikanth! Srikanth gets a new lease on life with Pablo Adian committing three unforced errors on the trot. He is now trailing as Srikanth picks up two points lead in the match. He leads 15-13. Srikanth wins two points in a row. An excellent drop shot followed by a smash to close down the room for Adian. HE has now bright the final game to a level footing. The score is level at 11-11. SRIKANTH TRAILS AT THE BREAK! Kidambi Srikanth trails by 11-9 at the break in the final game. Can he bounce back to win the match? This has been a fierce competition between the two shuttlers and no one is willing to give anything. Much to do for Srikanth to get back. What a rally between Pablo Abian and Kidambi Srikanth! Srikanth was forced to dive on his right, and then to his left, but eventually, his resistance ended with another smash by Abian. What a beautiful game. Abian leads 10-7. BWF World Championships Highlights: Kidambi Srikanth defeated Ireland's Nhat Nguyen 21-15, 21-16 to set up second round clash against Pablo Abian. He is the highest seed left in his half of the draw after second seed Lee Chong Wei pulled out on the eve of the tournament.